When you’re on holidays, it’s the perfect time to ditch the screens and just enjoy being present in all that surrounds you. However, if you’re on a never ending travel journey it’s always great to know a few places where you can set up your laptop and organise your life and get in some work hours. Jared and I have been floating around the popular work spaces in Canggu for some time now so I thought I would share some of our favourite work friendly spaces around Canggu. Alter Ego is a cafe just up the road from Echo Beach, Canggu. We have spent most of the last year working from here and LOVE IT! The staff are so sweet and really have gone above and beyond for us at times when they really didn’t need to. The food is amazing and super cheap and the coffee is some of the best in Canggu. This cafe is less than 12 months old but is already a well known nomad cafe so it’s likely you will meet some cool people here too! Kinship Studio is a very new addition to the Canggu co-working lineup and we are HUGE fans. Honestly, we have tried a few co-working spaces and felt really uninspired by them. They just never had the right vibe to fit our style of working, until we found Kinship. It’s a beautiful refurbished, industrial style warehouse that hosts communal working tables, private desks, private studios, meeting rooms and a fully equiped photography studio. It is honestly this creatives dream working from here. Oh, and they also have a Ruko pop-up coffee shop inside to keep you fuelled while you work! Finns Rec Club co-working space is made for people who are looking for a quiet, office style work area. It is the most quiet space we have ever worked in which is perfect for those days when you really need to focus. They also have amazing wifi, a separate ‘quiet’ room if you really need complete silence, booth style desks and the ability to order food and drinks from their cafe from inside the co-working space so you don’t need to leave your space. 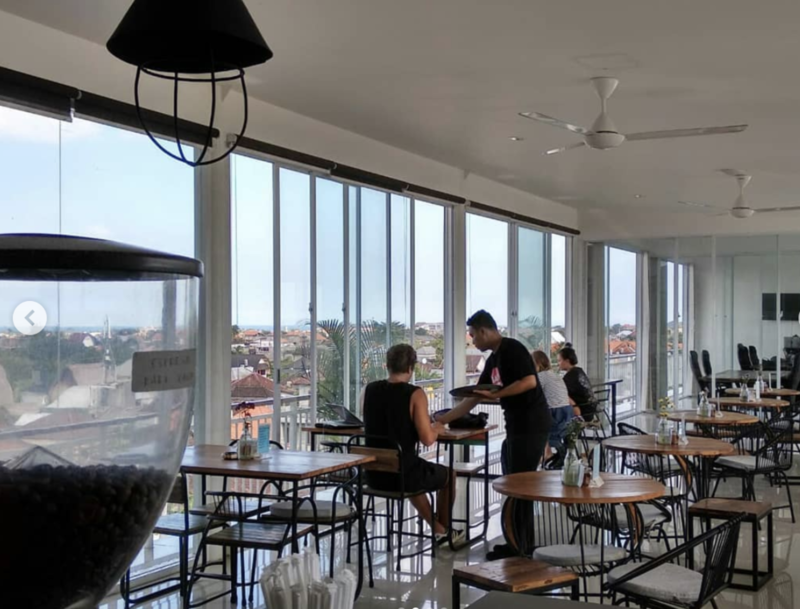 The Slow is a cafe and boutique hotel on Canggu’s main street, Batu Bolong. The Slow has become one of our favourite places to sit and work because of its incredible juices, natural outdoor setting and relaxed vibes. Whenever we feel like we need to get out of the aircon and enjoy the beautiful Bali summer breeze this is our go-to. Koloni Bali is a beautiful Cafe in Berawa that we have found to be such a cute space for working. The food is amazing and there is the option of sitting inside or outside. It is usually quiet but as it’s still a cafe there is an undertone of chatter which is always nice for white noise. There are plenty of outlets inside and there is a dedicated table for people to work from in the evenings when they are open for dinner. Matra is where we first stayed when we moved to Bali last year. It is a co-living building with a co-working space on the top level. The co-working space is open for anyone to use but if you want to connect to the fast wifi or use the air conditioned rooms you will need to sign up for a pass. The view from the top is beautiful and the space is open which allows an amazing breeze to flow through. They also have a Satu-Satu cafe pop-up which serves coffee and cafe style food. Alternative Beach is probably the coolest place you could possibly work for the day. You can set up your laptop in their cafe area and work away all day in between dips in their epic pool. The full venue is actually a gym, cafe, hotel, hostel and beach club so there is always lots happening. The food and staff are also great and if you work better in a place that has some noise and fun vibes, then this is probably for you. It’s located on Batu Bolong so easy to find and central! We have loved working in these spaces and love that we can share them with you. A good thing to remember, when you are working from a cafe or ‘free’ space, is that the wifi might not always be perfect and there will be chatter and general noise so if those things are really important to you, it might be worth investing in a co-working membership. We have also loved to support the cafes we worked from by purchasing food and drinks while we were there and we always encourage other to do the same. I hope you have all found some helpful tips in here and if you have any questions feel free to ask me via email or IG!